Nightmare at the Pump? Daydream it away. I’m being very literal here. It’s a squirrel. Or my husband. Hard to tell who’s nuttier since the feud began. At some point during one of our rare freezes, the varmint found a hole in the soffit and took shelter in the attic. We might have been more hospitable had it simply curled up next to the water heater or furnace or something to wait it out. But, no. It has to scamper, scratch, rip, claw, and irritate the hell out of Husband. No kidding. It sounds like the critter’s moving furniture up there. None of the human accesses to the attic (there are 3; our house is oddly configured) have given us the slightest hint of where it is, or any sign of a nesting place. That lack of intel may well lead to the total destruction of our home. Husband started by tapping the soffit with a rake handle. The first two times it worked. The squirrel shot outa there like an RPG. But then it began making forays deeper and deeper into the attic, to the point where we are now getting the full surround-sound of its activities. Now I vacuum plaster at least twice a day from Husband pounding the ceilings with mop and broom handles. An appropriate implement strategically resides in each room. But that’s not the worst of it. You see, even before the home invasion, Husband has been battling the fluffy-tailed rodents who persist in stripping our pecan tree and digging up his prized tomato plants. He has a .22 pump-action pellet gun equipped with (get this) a sniper scope. But he’s no longer content to be the terror of the back yard. This is war. Time to bring in the heavy artillery. I was sitting here on the computer the first time I heard Husband firing blindly all around the attic. Must’ve jumped a mile out of my chair. Then it escalated to strings of firecrackers that actually rattled the windows and caused the lights to flicker. But as if nightmares of smoldering insulation weren’t enough, it seems my father-in-law’s WWII issue M1 has come out of hiding. Fortunately, there’s no ammo for it. UNfortunately, there is for the more modern pistols which used to be safely locked in a strong box. OMG. Never mind the bullet holes in the ceiling. What about plumbing, heating and electrical? Once, sitting here listening to the scrapings above and the mayhem below, I confided my fears to my sister, the Mountain Woman. Not many days later, The Depression Era Cookbook arrived. Carefully bookmarked was a recipe for squirrel. Very funny, Sis. I’ll roast the critter over the embers of my home. These days it all seems to be disappearing: road trips, pensions, savings, jobs, retirements, even money for that most reliable time-honored escape: alcohol. What have you got left? Your imagination! Even the IRS can’t get that – depending on how you’ve been applying it, of course. Let’s look at what you can do with that which even a crashing economy cannot take away. Let me set a sample scene. Work with me here. Say I wake up one morning (I’ll do this in first person to ward off any possible offensiveness) and there’s a cloud over the sun. This is highly significant. Ever since I moved to this corner of Texas I’ve had a profound appreciation of clouds. I don’t care if they’re funnel-shaped, slamming hail and damnation upon the earth, or screaming in off the Gulf at 90 mph - just so long as they cover the sun. There’s an assortment of bills on the kitchen table, most of which I haven’t a prayer of paying. Here’s where clouds come into the decision-making process. I elect to pay the electric bill rather than gas up the tiny, rusted relic in the driveway because, see, if it’s cloudy I just might survive the two-mile walk to the nearest mailbox. 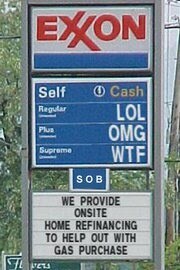 (The P. O. can’t afford gas, either, you understand.) So here we go. Sgt. Maj. Jonas Blane dominates the room as much with his piercing eyes as his physique. He leans casually against the refrigerator, arms folded across his chest. He’s wearing standard issue Army brown T-shirt and camo fatigues. His voice is bridled thunder. “No, sir,” I respond smartly. He whistles sharply and a brute the size of a horse marches around the corner. Sgt. Maj. Blane snaps on a leash. I adjust my floral print sun visor, slap wrap-around shades over my trifocals, and jam a plastic bottle of frozen tap water under the belt at my back. The vital message is tucked in a back pocket. I take the leash from his hand. “Good luck, soldier!” he booms. “Thank you, sir.” I salute. I leave my air conditioned house and hit the road like a stick of butter under a blow torch. The mission already seems impossible. The ice bottle is lukewarm in less than five minutes but there’s some relief as condensation soaks my clothes. The great dog pants but is otherwise taking this thick, oppressive heat better than I am. Suddenly the sun plunges free of its tempering veils and slashes at the landscape with searing brightness. As my eyes fog over with stinging sweat I depend more and more on the dog to pull me along. “Huh? What’s what?” I swipe at the sweat and blink up at a trim, wary looking septuagenarian. “Is that a dog? What kind is it?” he asks again. He gives me a strange look and moves along. I return to my fantasy. There are others staggering along out here with me. A few appear to be kids, one or two are older guys, but most are women like me. There’s no way of knowing which of them is looking to thwart this mission. I can see now why Blane’s men would stick out like big, muscular thumbs. The enemy would pick ‘em right off. Yes, it’s all up to me. Failure is not an option. He finally takes a few week sips; eyes still closed, heavy stubble going back to five o’clock three days ago. Then the large, liquid black eyes open. “Blane sent you?” he gasps. He goes limp. The large, mesmerizing eyes are lifeless. The dog that was sitting as still as a statue utters a deep-throated howl. All right. You get the picture. With imaginations in full gear we make it all the way to the mailbox, pay the electric bill, and score AC for at least another month. So, with apologies to Dennis Haysbert, who plays Blane in The Unit, and the jogger who thought my Chihuahua was a rat, it’s possible to do anything in a daydream. Why didn’t I apologize to David Krumholtz, you ask? I lost him. His numb3r was up. But here’s the thing: with the polar ice cap due to vanish by September he shall again emerge (soaking wet) as Bernard, Santa’s intrepid, wise-cracking, and very endearing Top Elf of “The Santa Clause” fame. So get to it, folks. Ride dragons, win gunfights, head off disasters in galaxies far, far away. And tell me all about it when we join the rest of the homeless under the bridge.